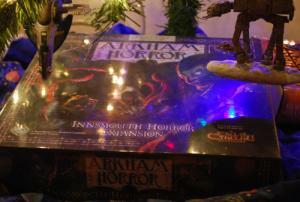 The Innsmouth Horror expansion for Arkham Horror lies nestled under the Geek Tree. Credit: Ken Newquist. The Innsmouth Horror expansion for Arkham Horror — my Birthday/Christmas present from my family — arrived today. It’s taken up its place of honor underneath the Greek Tree, where it will remain until Saturday, Dec. 26 when the Blackrazors convene to repel the Deep One invasion that threatens to rock New England. Naturally, we intend to bring as much firepower to bear on the problem as possible, as witnessed by the arrival of the Imperial AT-AT and Slave 1 at the top of the photograph.